Ed Andrews explores an unlikely wildlife haven, which is prospering thanks to a group of dedicated volunteers. In the village of Eardington, a gateway at the side of the road leads to an abandoned concrete track. The track is thick with leaf litter and leads through some metal bollards to an old weighbridge. This was once the entrance to a busy quarry, lorries constantly arriving to be loaded with sand and gravel. Now the only sound is the birdsong that signals the arrival of an early spring. The quarry buildings have been razed to the ground, the old gravel pits bulldozed. This unlikely place is set to become Bridgnorth’s newest nature reserve. Walking around Eardington Nature Reserve, you don’t feel as though you’re within a wildlife hotspot. Nature reserves should be green and pleasant places; this site stinks of industry and dereliction. Some might say it’s a scar on the landscape, a reminder of mankind’s insatiable demand for building materials. Such sites are often landscaped, covered in topsoil and planted with trees. If this happened at Eardington, a valuable habitat would be lost. The shifting piles of sand and gravel are home to some very unusual plants and animals. When Shropshire Council first got involved with the restoration project, wildlife surveys were commissioned. This is paramount when planning a new nature reserve so priority habitats and species can be identified. The surveys showed the site is important for many rare invertebrates including nationally scarce species of solitary bee and hoverfly. These insects bask on the sunny banks, some even burrowing into the soft substrate. Several unusual species of plant were also found, including blue fleabane and thyme-leaved sandwort. A species of moss was discovered that has only been found at three other sites in Britain. Conservation is a delicate balance and management of a site to conserve one species may well make the area unsuitable for another species. Many of the species that were found as part of the surveys are pioneer species that grow in disturbed ground before other vegetation gets established. Land will not remain open for long. The march of silver birch across the site would be relentless if action was not taken. The trees cast shade and make the site unsuitable for the invertebrates and plants that live there. Long-term management will need to control the spread of trees and maintain an open mosaic habitat of scrub, wetland and open ground. We’re lucky to have a very dedicated group of people known as the Friends of Eardington Nature Reserve, who are helping to manage the site. At the first volunteer day in January, around 20 people spent the day cutting and pulling out scrub to open up bare patches of sand and gravel on warm south-facing banks. In future it is likely that some areas of the site will have to be scraped with a digger to open up larger patches of sand and gravel. This will create germination pockets for the plants and basking areas for invertebrates. One of the most interesting parts of the site is the wetland area in the centre of the site. 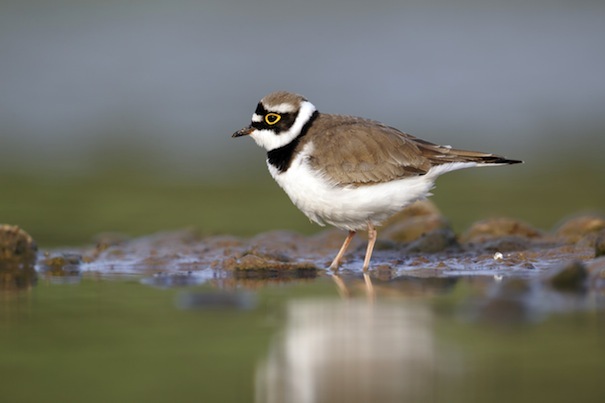 Birds such as snipe and little ringed plover have been recorded in the vicinity of the pool. The winter rains have meant that the pool has swelled. In summer it will shrink again and possibly even dry up. This prevents fish from surviving in the pool. Fish eat young newts so the lack of fish has allowed great crested newts to become established at Eardington. The newts spend most of the year sheltering amongst log piles and piles of rubble on the site. As you read this, they’ll be moving to the pool to breed. They are active under the cover of darkness and I’ve spent many enjoyable evenings searching the margins of pools with a torch, watching newts doing their magical mating dance. With the lack of large trees and the way the ground falls away in the centre of the site, Eardington Nature Reserve is big sky country. On a brisk winter’s day, the sky is a constantly changing panorama. One minute it is monochrome with grey clouds overhead, the next minute the heavens are illuminated by rays of golden sunshine that pick out the clumps of rush growing at the edge of the pool. The conditions that are found at Eardington Nature Reserve are seldom found elsewhere in the modern countryside. I’m sure that the true wildlife value of this site will become more apparent as it matures and develops. Would you like to get involved with the Eardington Nature Reserve project? The Friends of Eardington Nature Reserve hold regular meetings to discuss works needed at the site. Whether your interest is in practical work, wildlife surveying or helping with grant applications, we would love to hear from you! For more details, please contact me by email ([email protected]) or telephone 01746 781192.